At the top of the heap in the world of lawn mowing is of course the big daddy of them all, the ride on mower. Designed for large gardens of half an acre or more, the best ride on mowers have many advantages, not least that they make the task of cutting the lawn far more enjoyable than push along mowers. Ranging from compact ride on mowers, to larger lawn ‘tractors’, here we’ll take a look at the key features to consider with all of these machines if you’re thinking of making the jump from ‘walker’ to ‘rider’. As mentioned above, ride ons are suitable for larger gardens, but that doesn’t necessarily mean you need to own a country estate. Let’s suppose for a minute that your garden is a fairly decent size, perhaps under an acre, but you feel that a ride on mower is still going to be too unwieldy for your purposes. In this case it might be worth considering a compact ride on mower. Taking the example of the Lawn-King SG60RDE (below) you can see that this type of mower isn’t much bigger than a mobility scooter, is small enough to move around a garden with flower beds and other obstacles, and is also narrow enough to move through gateways and narrow passages. Compact ride on mowers typically include a whole host of features to make your life easier and safer. This includes mulching kits, large grass collection boxes that can often be emptied whilst still sat on the mower, electric starter motors, and automatic gearboxes. From a safety perspective many models require that the engine be in neutral and that the grass box is in place prior to ignition. This all worth checking out as you do your research. Clearly then you shouldn’t feel that you’re exempt from using a ride on if you own a large yet still manageable sized garden. Having said that it would also be foolish to invest in one purely for the sake of it given the obvious expense compared to other mowers. To give you some idea, a push along petrol powered lawnmower might retail for somewhere in the region of £250-500, whereas an entry-level compact ride on mower would set you back at least £1200. Lawn tractors are, as the name suggests a step up from the compact ride on mower, and these beasts are the right tool for tackling large areas of one or two acres (or more). 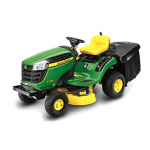 As with the Lawn-King RC125 Ride On Tractor shown below, the engine is typically located in front of the driver seat, and generates upwards of 8Kw of cutting power, perfect for challenging areas and tough terrain. Some lawn tractors are also powerful enough to carry out other tasks such as towing, but check the manufacturer specification when thinking of buying any that catch your eye. The most important thing to remember about lawn tractors is that they’ll (quite literally) make short work of almost any lawn. 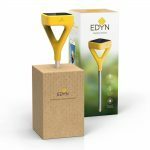 Typically they have a cutting width of 76cm or more, and a grass collection box of at least 150 litres, meaning that you can power through the job without needing to stop to empty the grass, or even for a half time cup of tea. One important thing to note is that if you plan to use your mower on sloped areas then you should check with the manufacturers specification that it is designed to be used in this way. Ride on machines fitted with four wheel drive mechanisms and pump lubricated engines are the best mowers for slopes, as they allow for pretty fault free and effective cutting on banks and slopes. In any case you should always be careful when using a ride on lawn mower on a slope because there is always a risk of the mower toppling when the centre of gravity goes beyond a certain point. If you have a large plot of land that also happens to have a fair proportion of banks or sloped areas then we would seriously recommend you invest in a good petrol hover mower as well as a ride on, as these are ideally suited to cutting on slopes, and much safer than a ride on mower under these circumstances. For the very largest and most demanding gardens, Garden Tractors offer the ultimate solution as an overall garden upkeep tool. 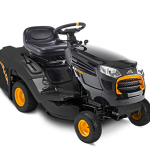 Usually boasting an impressive 11Kw or more of on-board power, these machines are designed for large areas of two acres or more, and can cope with the most unforgiving terrain, often designed to enable towing, snow clearing, and tilling, and not forgetting cutting the grass. 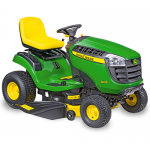 Depending on the model and price some garden tractors come with some or all of the accessories to help with the other tasks in the garden, and others offer them as extras that can be purchased separately as an when required. 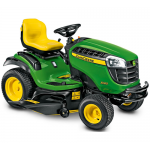 If your garden is covered in obstacles like flower beds, garden gnomes, and a pond, then the best ride on mower for you might well be one with the ability to turn on the spot, also known as a ‘Zero Turn’ model. 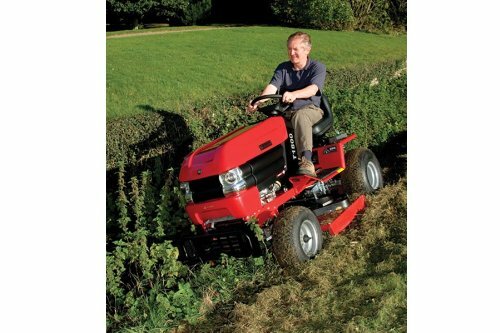 These mowers feature individual drive to each rear wheel giving you a far greater level of control and manoeuvrability, perfect for negotiating a slalom like garden layout, or parking up in a tight space. So, now you’ve got some idea of the options available to you, the next step would be to take a look through our comparison guide below. 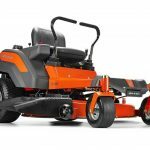 Here we look at some of the top-selling ride on mowers available and compare key features. This gives you a good idea of what you should expect to get for your money. 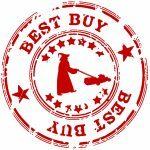 I’m looking for a second hand/used ride on mower or lawn tractor.